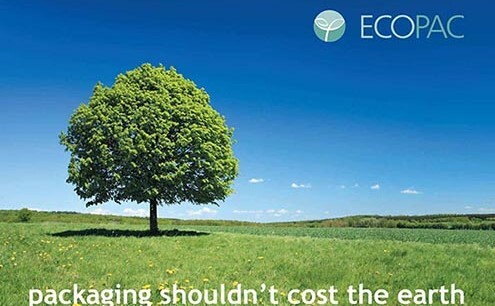 A guiding principal of ECOPAC is to work with our customers to reduce the environmental impact of packaging. In response to demand from our customers we’ve developed an ever growing range of products that are a serious alternative to traditional packaging products but with a lower impact on our environment. Eco box Our standard range of stock size cases and all bespoke cases are available in 100% recycled and 100% recyclable material. Recycled paper uses half the energy and 60% less water to produce than virgin fibre paper and with modern papermaking technology the performance results are very close. Also with most recycled paper used in the UK being sourced from either UK or European mills there are less road miles clocked up delivering than virgin fibre papers which tend to be sourced globally. Using recycled liners often has a cost benefit too. Recycled paper and bio-polythenes are a viable alternative to standard polythene bags. Available in a range of sizes, talk to your account manager to find out more.